On February 11, Aperture trustees and friends gathered to celebrate John H. Gutfreund’s twenty years of service on the foundation’s Board of Trustees. 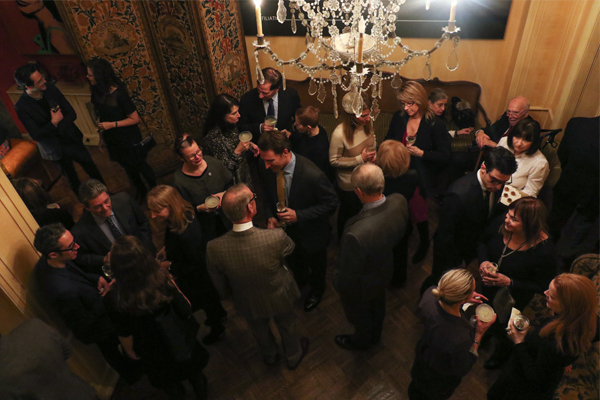 Fellow board members Sondra Gilman Gonzalez-Falla and Celso Gonzalez-Falla hosted the fête, with cocktails and hors d’oeuvres, in their Manhattan home, where guests had the opportunity to share stories about Mr. Gutfreund and his earliest years as chairman of the Aperture Finance Committee. Mr. Gutfreund received the warmest of receptions, as Aperture executive director Chris Boot and current board chair Cathy Kaplan toasted his remarkable record of service to Aperture, including his former post as board chair. Former trustee Mark Levine applauded Mr. Gutfreund for his leadership and warmly acknowledged his wife, Susan Gutfreund, for her invaluable contributions to the foundation. Mr. Gutfreund was presented with the Paul Strand print The Court, New York, 1924, signed by fellow board members, to commemorate the evening. Mr. Gutfreund became a trustee of Aperture Foundation in 1996 and served as chairman from 2001 to 2005. Active in the worlds of finance, politics, and philanthropy, he serves as a trustee of Montefiore Health System and is an advisor of the Universal Bond Fund and president of Gutfreund & Company. He also served as vice chairman of the New York Stock Exchange and was the chief executive officer of Salomon Brothers. The UJA-Federation of New York has honored him for his charitable activities and contributions. Mr. Gutfreund will always remain a special part of Aperture’s community of loyal friends and supporters. Aperture Foundation is a non-profit 501(c)3 organization that relies on the generosity of individuals for support of its publications, exhibitions, and public and educational programming. Click here to learn more about how to affirm your place in the Aperture community. Aperture Members Celebrate the Launch of "Platform Africa"